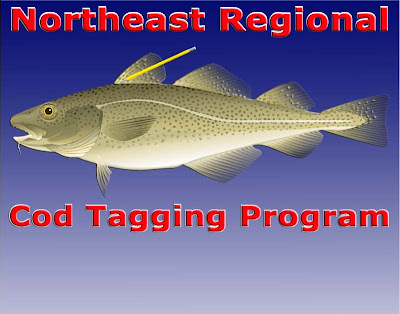 The NRCTP has put out an overview of its study, a five year program to track the migration patterns of cod in the waters of the Northeast, including the waters of the Gulf of Maine. Click on the pic above to get to the program web page. In looking at the results, I find figure 7 to be the most illuminating. It depicts the least concentration of migratory fish in an area extending from Penobscot Bay out to Georges Bank, almost as if the greatest concentration of migrants can be found following a path that skirts the outer boundary of the Gulf of Maine. You can download the report and the figure mentioned above from the page located here. Fossil Found in Spitsbergen -- Largest Sea Reptile Ever! You can find the BBC Story here. What an amazing find. 50' of prehistoric crocodile. The Pliosaur. Imagine it. About the size of a humpback whale. Not long ago Sandra and I were watching some old footage of the Croc Hunter on Animal Planet. He was hunting and capturing a Salt Water Croc of about 15 feet. It was night. When they came up on one, not even the big one they were hunting, with his head and torso floating just above the water line, I turned to Sandra and said: "Can you imagine being in a small boat just off the beach and having one of those come up next to you?" AP Story -- Man Dies from Shark Attack! WEST PALM BEACH, Fla. (AP) -- An Austrian tourist died Monday after being bitten by a shark while diving near the Bahamas in waters that had been baited with bloody fish parts to attract the predators. Markus Groh, 49, a Vienna lawyer and diving enthusiast, was on a commercial dive trip Sunday when he was bitten about 50 miles off the coast of Fort Lauderdale, said Karlick Arthur, Austrian counsel general in Miami. You should check out your dive operation thoroughly before making reservations. Make sure it isn't some fly-by-night outfit, or one with a track record of accidents and/or law suits. I'm not saying this one above is such an outfit. However, as a former shark dive trip operator myself, I can honestly say every one of us are in it to make a buck. I ran a SHARK CAGE diving trip, which meant no going outside the cage. 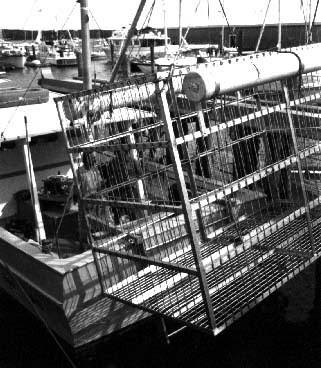 My cage didn't even have door openings on the sides. Don't get me wrong, diving with sharks without a cage doesn't have to be high risk. It depends on the situation and the sharks. Look at Tom's dive below: For one thing, they're on the bottom, which means they only have to worry about what's above them and to the sides. The worst direction -- the down direction -- is of no concern. The sharks are also corralled by their source of food, almost being hand fed, and the participants are surrounding the sharks; they're not swimming freely in a chum slick. Moreover, Tom is sharing the water with reef sharks, not tigers and hammerheads. The tiger is one of the top three man killers, the other two being the bull and the great white. Safety may not be a top priority to some operators. For some, the top priority might be a combination of thrills and, of course, money. You get the thrills, and they make the money. If you're going offshore 50 miles to swim with tigers and hammerheads, and you're in deep water, with your feet dangling below you, the bottom more than 200' away, surrounded by a chum slick and a bunch of active, possible frenzied animals; if at the same time you have more than two or three people in the water with you, then some of you are in a very high risk situation, regardless of who's running the show. A word about chum. A chummer can lull a bunch of sharks into a collective state of calm, almost as if they're hypnotized, or he can wait for the right time and start chunking up larger pieces of fish and guts and get a frenzy going. Tom's New Friends -- Caribbean Reef Sharks. . . . This is about 6-1/2 miles southwest of Pamola Peak, which is covered in clouds and snow. 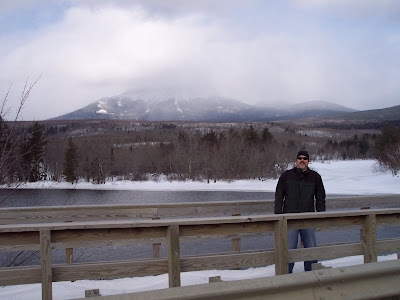 Dwight and I were checking out some camps on the West Branch of the Penobscot when we stopped for a breather and a photo op on the bridge above Abol Falls. Same location above but without the mug shot. 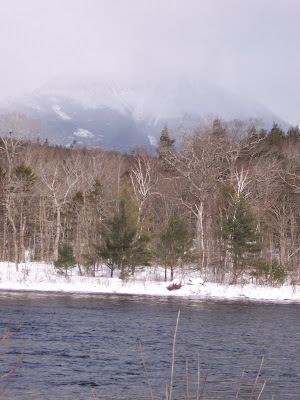 Below is a shot of the mountain taken from across the Nesowadnehunk Deadwater. I almost got my door taken off by a pulp truck here, jumped in the seat and shut the door just in time. 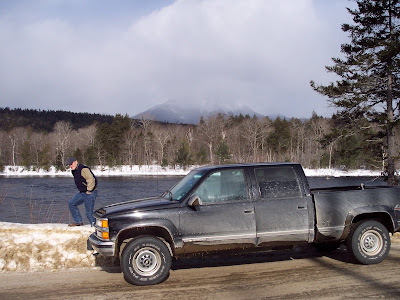 Word to the wise: Don't park around blind curves on the Golden Road in winter. BOSTON - Technicians on the Catalunya Spirit Liquefied Natural Gas tanker restored full electrical power to the vessel's switchboards Tuesday night and continue today to make progress toward resuming the ship's propulsion. The ship is at the future site of the Neptune Offshore LNG facility off Eastern Point Light near Gloucester, Mass. The Coast Guard Cutter Escanaba remains with the Catalunya Spirit enforcing a safety zone around the tanker. The Unified Command at Coast Guard Sector Boston is monitoring and managing the tanker's safety and ongoing repairs. The vessel has not suffered any structural damage or released any product. The Maine Responder, currently on scene with the Catalunya Spirit, has 2,640 feet of boom on board. The New Jersey Responder is en route carrying an additional 2,640 feet of boom. There are 17 additional spill-response boats in the area that could respond to a fuel oil leak in three to four hours. Another 150 spill-response boats could be on scene in eight to 10 hours. The Catalunya Spirit regularly delivers LNG to Boston. The Coast Guard is overseeing the vessel's repairs that will be certified and approved by the Captain of the Port of Boston prior to any future deliveries to Boston Harbor. Every LNG ship that enters the Port of Boston undergoes an extensive pre-arrival check by a Coast Guard marine inspector. State, local and Coast Guard security boats meet the ship at the harbor entrance and ensure safe passage to the LNG terminal in Everett, Mass.